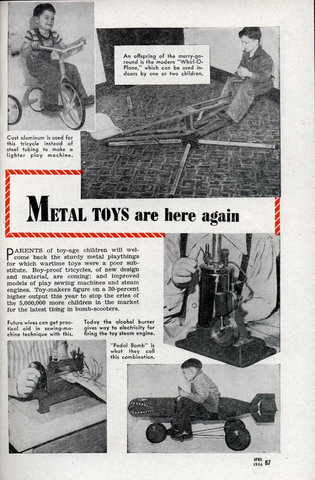 PARENTS of toy-age children will welcome back the sturdy metal playthings for which wartime toys were a poor substitute. Boy-proof tricycles, of new design and material, are coming; and improved models of play sewing machines and steam engines. Toy-makers figure on a 30-percent higher output this year to stop the cries of the 5,000,000 more children in the market for the latest thing in bomb-scooters. 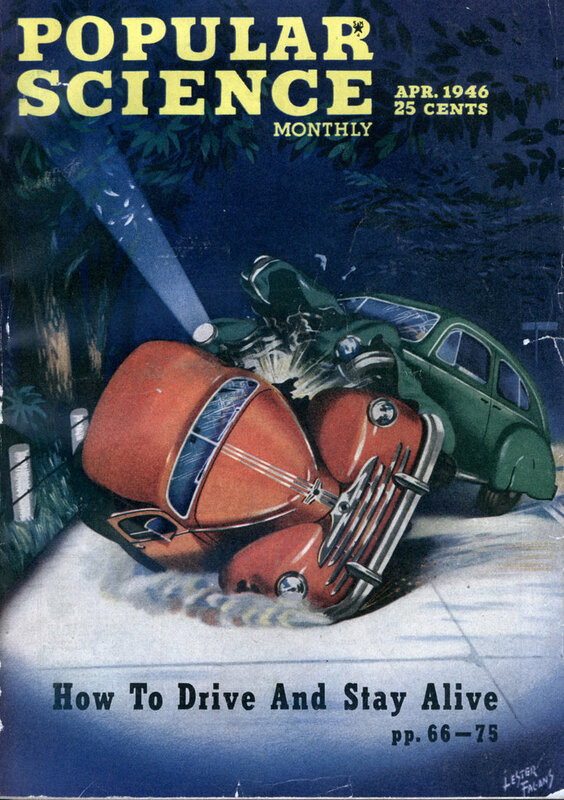 As opposed to the more accurate “Suicide Trike”? Look at all those great toys for boys…and a freaking SEWING MACHINE for girls. Why didn’t they just make her a “toy” toilet scrubber and get to the point? There’s another one like this where the girl gets washing machine. I’d rather my kid got the sewing machine than the suicide bomber trike…..They had some weird ideas back then. It’s like when older folks get all nostalgic for the 50’s, but don’t seem to remember it was a great time, but only if you were white. And male. Why do they *think* those housewives stayed bombed all the time on highballs and “Mother’s helpers”? Strange times. Hmm, it’s the small in home version of the large outdoor spinning merry go round. Also known as the wheel of death.